Washington’s bike rental system is expanding next year, promising to remain competitive as new, high-tech rivals enter the region’s bike-sharing market. Capital Bikeshare is slated to widen its reach in 2018 with the addition of more than 100 stations, hundreds more bikes and a larger coverage area — investments that are worth more than $5 million of federal, local and private funds. “When we launched in 2010 there were only 100 stations and two jurisdictions,” said Kimberly Lucas, the District’s bike-sharing program coordinator. Now, Capital Bikeshare is available in the District and Alexandria, plus Arlington, Montgomery and Fairfax counties. Prince George’s County and Falls Church are joining next year. And they are coming online at a critical time for bike sharing. 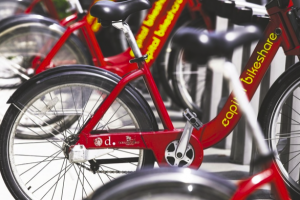 The District last month opened its market to four dockless bike-sharing companies, allowing each of them to bring as many as 400 bikes to city streets. Some of the start-ups are eyeing expansion into the Washington suburbs.